Every once in awhile, I'll get myself amped up to build my own modern dollhouse. 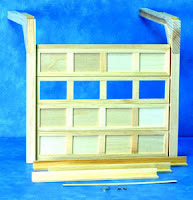 I'll buy some fresh supplies and make sketch drawings of what the finished structure will look like. I'll stare at the individual components, imagining how they'll work with the design and then the project starts to look like a lot of pieces...a lot of wood...a lot of styrene...a lot of acetate...a lot of Plexi = a lot of work. 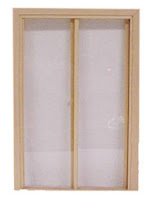 Anyway, I thought I would share my interest in Timberbrook's line of sliding doors, pocket doors and garage doors. I always wanted to build a miniature house that had sliding doors for each room and a set of garage doors that opened the family or living room to outdoor space. I had planned to hack the panels of the Timberbrook garage doors with Plexi but like most projects, they sit in a storage tote waiting for my time. 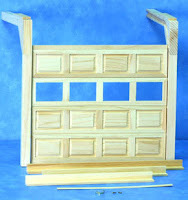 I have seen these Timberbrook doors at most hobby supply stores but you can find them online with a quick search. I just want to say that I really, really enjoy your blog...sure you have been told that many times. I am not into the Victorian or "oldie" houses. I appreciate your information on modern dollhouses. Wish more people were into this style! The only comment I would like to make is that I need you to post every day!!!! Only kidding! Ha ha! Thank you. I would post every day but since I'm a working parent, I get bit by the LAZY BUG from time to time. Usually I do everything involved with this blog after everyone is tucked into bed, but lately I've been going to bed right after them. Sadly, I expect more lag time between entries. Sorry to all.